• You work for someone who doesn’t value your contributions. • The customer won’t come to the table. • That “someone” on the team keeps making mistakes. • The resources you were counting on are disappearing. • And why do “they” keep dwelling in negativity? The gravity of our focus can lead us to become the people we don’t like to be around: de-activated. Whiners. Complainers. Victims. The pain for most of us occurs within: We know we’re capable of more. • What (or who) will be your inspiration today? • What idea, vision or motive will elevate your actions? Hold the belief that you are autonomous of dysfunction. 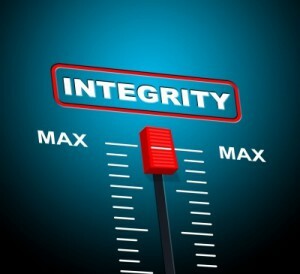 You possess the power to reject invitations to compromise your integrity. Stay true to who you know you are, despite what the world may want you to be.